USB, it's where to be! One of my favorite updates to add to a kitchen, or really any room in the house, that doesn't involve any demo, is swapping out an outlet for one that has a USB port. It is such a simple update that you can do to add convenience to your space. I am always on the hunt for a charger in my house. It is hard enough to keep track of the charger cord, especially with kids that are "borrowing" them for their tablets, iPads, or phones, let alone hunting down the cord and the wall plug. You can eliminate one piece of this treasure hunt by installing one of these receptacles in your kitchen, replacing your bedside outlet, or even swapping one out in your bathroom, depending on how often you need to re-charge! You already have the outlet there, might as well up their function! 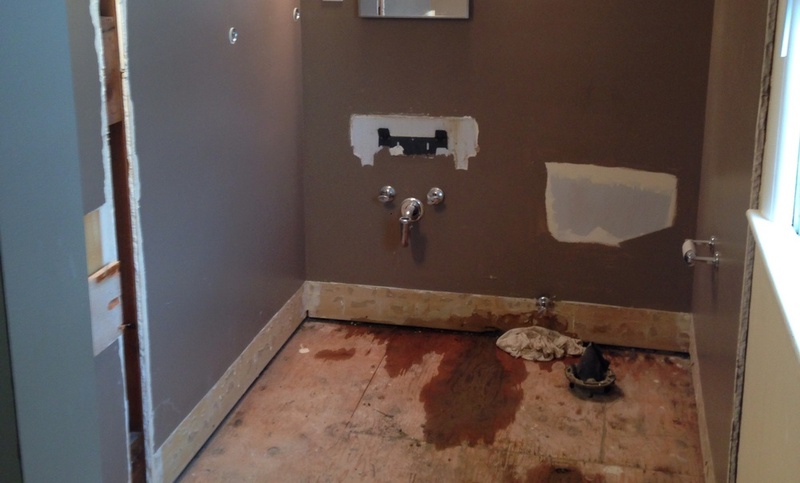 When planning a remodel there are important steps to take to make the process as smooth as possible. 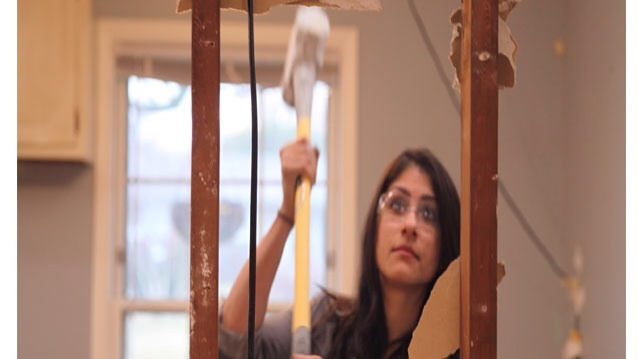 To help minimize surprises during a renovation, here are a few key things to consider before the first swing of a hammer. Determine your WANTS and your NEEDS. These two things can be drastically different. And depending on your budget you may only be able to afford what you need. What is the reason for this renovation? If it is to customize your home for you and your family, your wants and needs are very important. If the remodel is to add value to your home so you can sell it quick, and for top dollar, a potential buyers' wants should be considered. THE BUDGET. Know what you have to spend on your project. Have a contingency fund in case something unexpected comes up like: mold or water damage, termite damage, electrical or plumbing issues that you wouldn't necessarily know about until you start opening up walls. THE TIME FRAME. 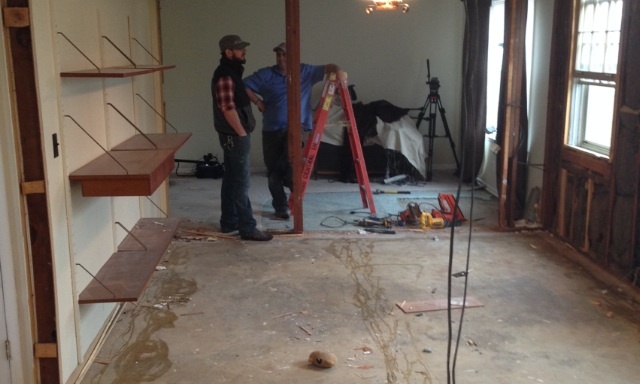 There is a lot of planning that goes into a reno. Are you going to be able to live in the space while the project is going on, or will you have to find accommodations? With my experience the better planned you are before you start demo, the better chance you have of staying in your predicted time frame. Pre-order items that have a long lead time. Cabinets, especially custom cabinets can take weeks to get in. Certain fixtures could be on backorder. Whoever is in charge of ordering things has to stay on top of it. Which leads me to the next important step. THE CONTRACTOR and DESIGNER. Whoever you go with will be in your home like they are part of the family, so it is ideal if you like them! All the time I spend up close and personal with my clients, I end up becoming good friends with more than half of them. If you don't have a go to contractor, interview a few, get bids from several and even visit one of their current job sites. You want to have someone that treats your home like they would treat their own. A clean job site is so important! And remember a good contractor is always busy! You may have to book them a month or more in advance. Finally, jump in and go with the flow. If you have a good contractor and designer you should be able to sit back, relax, and trust that the job will get done and done right. To follow up with yesterday's post, here are some fab lighting options for above your dining table. There is a nice mix in here, long ones for rectangular tables, semi flush mount if you have 8 foot ceilings but still want the feel of a chandelier in your dining room. Updating your dining area with a new light fixture will instantly freshen up the space! There is nothing like gathering around the dining table with friends and family. I love round tables for this. It almost feeling like you aren't only sitting next to one or two people, but you are sitting next everyone. You have a clear line of sight around the whole table. and conversation can flow much easier than sitting at a rectangular table. With that said, I have round up 10 of my fave round table picks. From splurge to steal, there is sure to be one here you could totally picture in your home! Which one is your favorite? 1. This table is available on Bludot. It comes in this super fun green or a nice neutral black and 2 sizes to pick from. 2. 3. and 4. are all available from Arteriors. As you can tell, I have been swooning over all things Arteriors lately. 5. This is the classic Tulip Table. You can find it many different places. If you want to splurge then grab it at Knoll or a retailer that carries Knoll. For a steal, Dot and Bo makes a replica that is quite affordable. 6. LOVE this table by Jonathan Adler! So fabulous. Definitely a splurge, but well, well worth it. 7. This is the Saxon table available at Dot and Bo and is a total steal right now. It is neutral and would look great in so many spaces. 8. This is a perfect round farmhouse style pedestal table from Belle Escapes. 9. Find this table at Pure Home for a steal of a deal. 10. The Traci table by CMI is a fave of mine. I have used it for several clients homes. There is a built in Lazy Susan in the center!! Enough said. You can find a local retailer on their website. Bliss Home here in Nashville carries this table. Of course every dining table needs light! Dining table lighting up tomorrow. Every side table deserves some style and personality. Whether it's your bedside table or a table by your favorite chair, make it pretty! This first table is the classic Eileen Gray side table. I LOVE how streamline the design is, and that it works well with many different styles. I started this table off with a black desk-style lamp. And of course flowers. The beautiful red roses add a huge pop of color. When styling a side table, or any table for that matter, flowers are a key component. Flowers can bring a space to life almost instantly. I love having them all about my house. I finished off the table top with a couple trendy jacks and a leather notepad. And thats it! Tons of personality on the table without a whole lot of fuss. The second table I actually refinished earlier this week. It has that hollywood regency look with the gold frame and mirrored glass top, so I decided to go with gold accents and pretty white hydrangeas. A lamp is also a great kick off point. 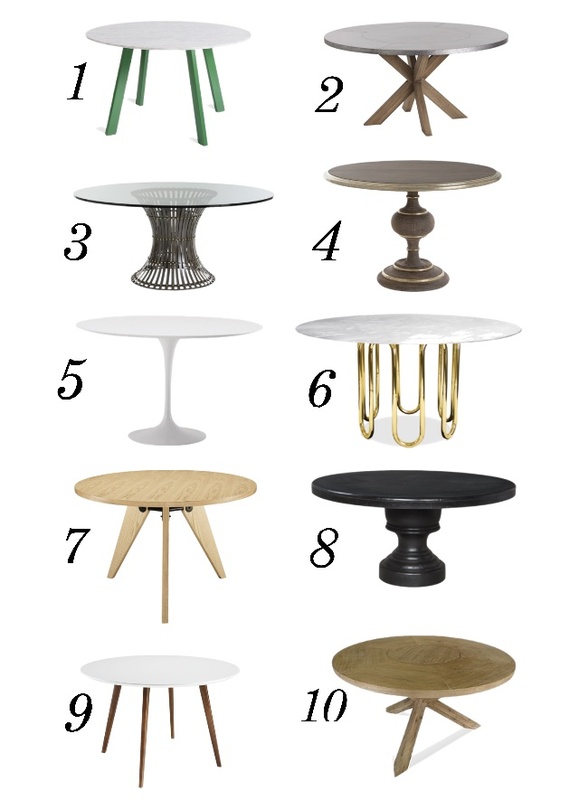 It can help you decide which style your table will have. This glass and gold lamp sits real pretty on this table! I threw in a candle and a small accent tray to finish off the look. Here are a few more sets of goodies to help inspire your side table style. I had been meaning to refinish this simple metal and glass side table. 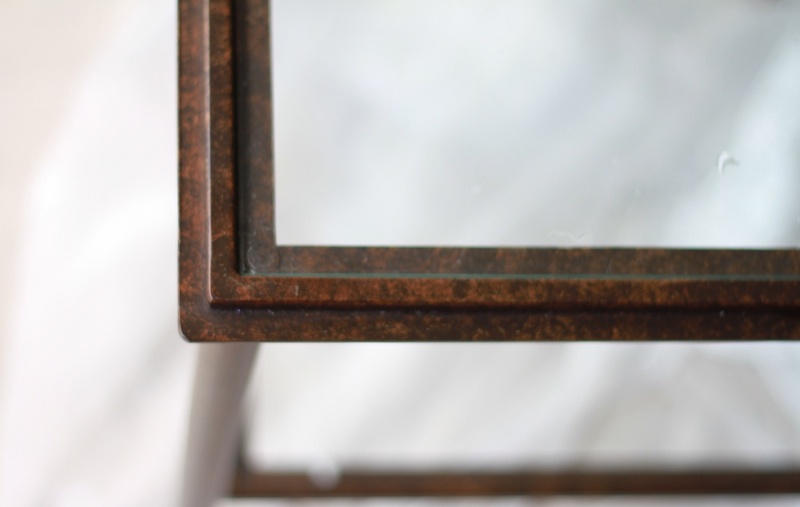 I love that antique mirror look so I researched how to do it yourself. I found this spray paint by Krylon called Looking Glass. It's awesome, and the whole process is so easy and quick! The final product turned out beautifully. So I want to share with you how to make your own antique mirror out of glass. 1. The side you spray is going to end up being the back of the mirror. When it is dry and you turn it around, that will be the reflective side. 2. shake shake shake that spray paint before using. And shake in between coats. Be sure the glass is very clean before spraying it with anything. Fill a spray bottle with equal parts vinegar and water. This will be used for antiquing the mirror finish, the paint doesn't stick to the spots that have been misted with the vinegar. Mist the glass with the vinegar, then spray with paint. Spray with even slightly overlapping lines. wait one minute, then dab the misted spots with a damp paper towel. Repeat the process, misting it with vinegar as you like. I misted mine before the first two coats, then finished the last three coats without the vinegar. I ended up doing 5 coats. It dries super fast. We are well into spring, and my favorite part is all the flowers of course! Instead of your traditional vase and bouquet, here are a few fresh ways to bring all the floral fun of spring into your space. 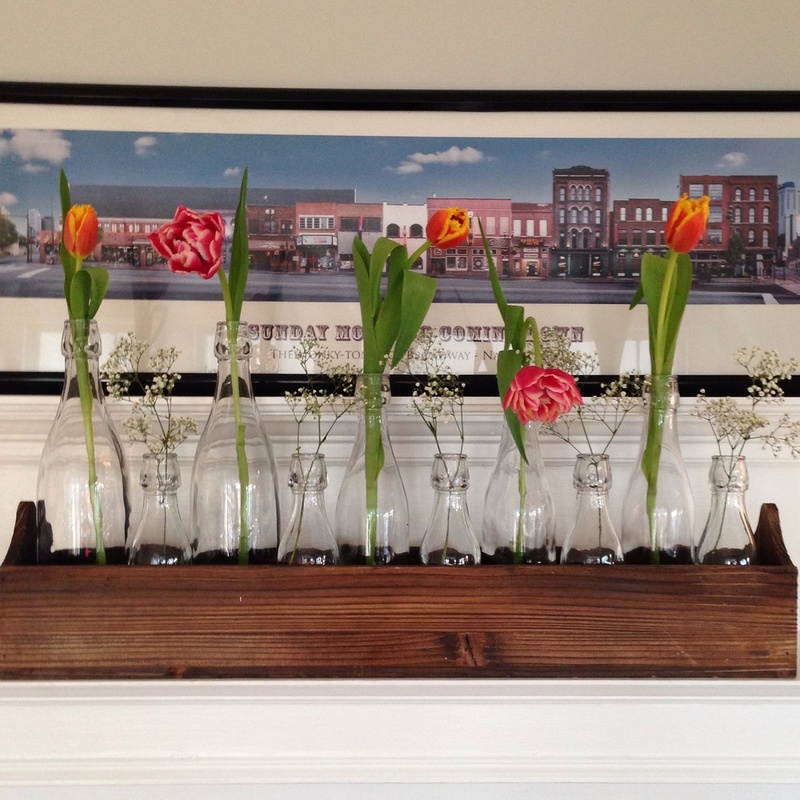 Most everyone has a jar or two in their fridge that will make a great vase. I hand painted these three jars with liquid gold leaf et voilà, trois vases! Hand painted jars make really pretty vases! If your vase has a wide opening, cut flowers so they rest right on top of the vase to create a vibrant floral pouf on top! 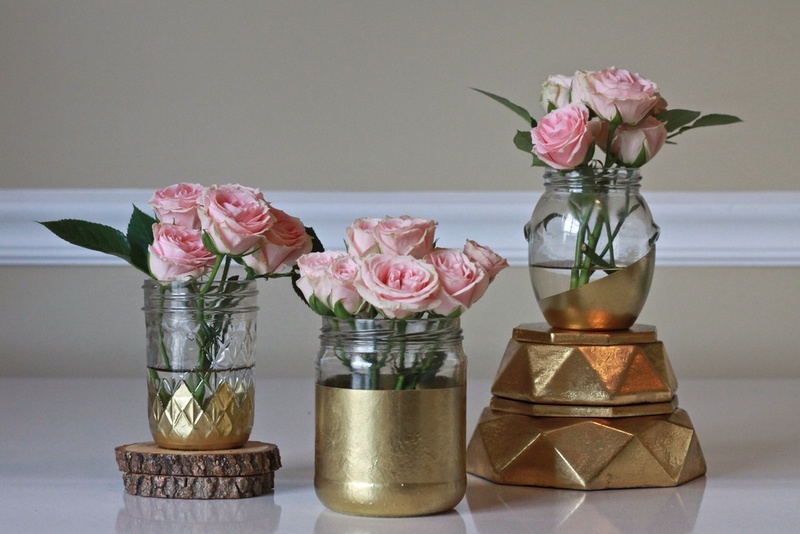 Single bloom vases are perfectly sweet. One or two of them placed about your space is lovely, or several narrow vases together create a really beautiful display of blooms. White ceramic accents are a fave of mine. This fun fish is actually a pitcher, but doubles beautifully as a vase. Ceramic deer head anyone? Yes please! Have fun with spring, it comes and goes so quickly! It's here! The grand opening of LAVA's online store. I am super excited to show off everything we have and post pics of ways to incorporate these items into your space! I will be adding pieces here and there, as I fine tune the store. Keep an eye out for some custom pieces, coming soon! Alana and I have been brainstorming about different furniture we can't wait to get started on! Our first two end tables are just about done, and we have lots of other awesome things in the works! Stay tuned. My name is Lex LeBlanc. I am an interior designer, home remodeler, and mom of two! I attended New York School of Interior Design where my love for all things interior design grew. After attending NYSID I was lucky enough to work for an amazing interior designer, in NYC, where I learned the ins and outs of how to run your own interior design business, successfully. A big move in 2014 landed me in Nashville, one of the hottest cities on the map right now! While I am still a New Yorker at heart, I have found plenty of room to let Nashville in and am falling in love with it more and more each day. It is the perfect mix of city and country tied together with a big southern comfort bow! I started LAVA Home Design in 2014, and have had the pleasure of working with so many great families in Nashville. From space planning, furniture selection, home staging, to kitchen and bath remodeling, I'm game for it all.